Maybe hard to believe, but this Friday, July 31st, marks Harry Potter's 35th birthday. 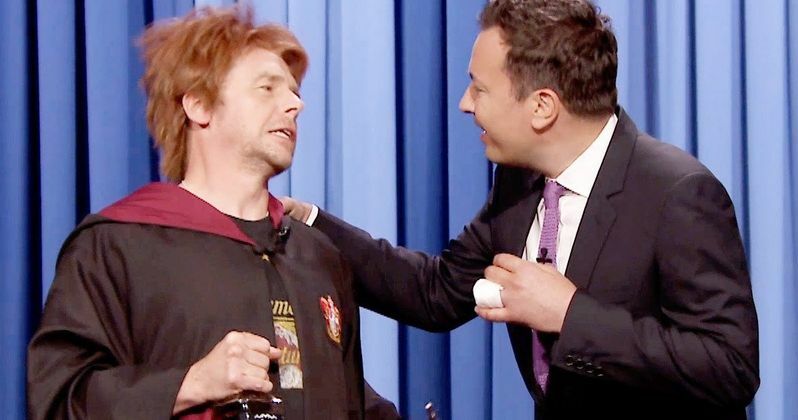 To celebrate the occasion Drunk Ron Weasley (Simon Pegg) visited The Tonight Show Starring Jimmy Fallon to wish Harry Potter an early happy birthday. As you can see in the video, things did not go according to plan. And it seems Ron has had a rough go of it these past few years. From the start, Ron seems distracted. He is obviously jealous of all the attention his best friend gets, especially with so much thought placed on the Wizard's 35th birthday. Weasley quickly gets sidetracked, attempting to show Jimmy Fallon his Fifty Shades of Ginger and his Chamber of Secrets. Jimmy tries to corral the unruly wand-waving slosh, but it's to no avail. The floundering wizard seems more interested in his bottle of Jack Daniels. Will Ron throw up? Maybe. Will he cry? Yes, definitely, as he contemplates his broken marriage to Hermione. You might remember from Drunk Ron's last appearance on The Tonight Show Starring Jimmy Fallon that his wife left him for Neville Longbottom. Trying to cope with his horrible, messed up life, Ron tempts Jimmy into doing a shot with him. Last time, Weasley was more interested in chugging beers. While his alcohol of choice has changed, his stumbling demeanor has not. After guzzling directly from his bottle, Ron awards 10 points to Gryffindor for his marvelous swallowing abilities. Jimmy politely tries to see him off stage, but the middle-aged magician isn't having it. He tries to get the audience to chant 'Weasley is our king!' But just as they begin to join in, he breaks down in a snot-filled fit. It seems Hermione has left their love shack once again, only this time she is having a torrid affair with Viktor Krum. Using his wand, he demands 'Curtains Openus!' He then runs off to join Ashley Madison. While this is all in fun and games, fans are taking Harry Potter's birthday very seriously, with celebrations being thrown around the world. The half-blood wizard with the lightening bolt scar was born July 31, 1980. And it was on his 11th Birthday in 1991 that he joined Hogwarts academy, exactly 24 years ago. The first book, Harry Potter and the Philosopher's Stone, didn't debut until June 1997, with it's 20th anniversary arriving in just two short years. The legacy of the Harry Potter universe will continue on the big screen in next year's Fantastic Beasts and Where to Find Them, which arrives in time for Thanksgiving 2016. While you get ready for your big Harry Potter themed party this weekend, check in on Ron, and realize that he might need a birthday wish or two to help him through these trying times.